Two teams that had not recently been to the postseason, the Cleveland Browns and New England Patriots, met in an AFC Wild Card game on January 1, 1995. The Browns had endured four straight losing seasons since last making it to the playoffs in 1989, and New England had also gone through some rough times after their last appearance in 1986. Cleveland was in its fourth year under Head Coach Bill Belichick and placed second in the AFC Central with an 11-5 record, qualifying for the playoffs as a Wild Card. 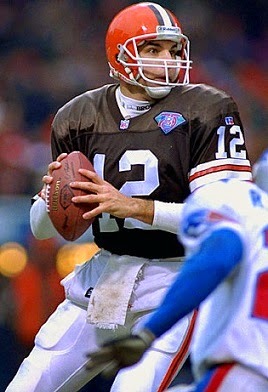 Eighth-year QB Vinny Testaverde (pictured above) was proving more successful in Cleveland than he had been in six seasons with Tampa Bay, but was still prone to throw too many interceptions, and FB Leroy Hoard was coming off a Pro Bowl season. But it was the defense, which gave up the fewest points in the NFL in ’94 (204), that was the key to the team’s success. The line contained Pro Bowlers in DE Rob Burnett and DT Michael Dean Perry while two ex-Giants, Pepper Johnson and Carl Banks, performed ably at linebacker and FS Eric Turner was a consensus first-team All-Pro. The Patriots were in their second year under Head Coach Bill Parcells, who had previously guided the Giants to two NFL titles. Second-year QB Drew Bledsoe was named to the Pro Bowl after passing for 4555 yards and 25 TDs, although he also tossed 27 interceptions. He had an outstanding target in All-Pro TE Ben Coates. The running game was problematic, where RB Marion Butts averaged only 2.9 yards per carry and was being benched against the Browns in favor of Corey Croom, a faster back but one who did not have any carries during the regular season. The defense steadily improved over the course of the season and led the league in takeaways (40). New England had won its last seven games to finish out the regular season after getting off to a 3-6 start and that resulted in a final tally of 10-6 and a second place finish in the AFC East. There were 77,452 fans in attendance at Cleveland’s Municipal Stadium in a light drizzle that turned to snow. Following a punt by the Patriots, the Browns drove 74 yards in 10 plays on their first possession. Vinny Testaverde completed a pass to WR Michael Jackson for 27 yards in a third-and-five situation and also had tosses to WR Derrick Alexander for 23 yards and Jackson again for 12. Matt Stover kicked a 30-yard field goal to give the home team the early 3-0 lead. On New England’s second play following the kickoff, Drew Bledsoe’s pass was intercepted by safety Louis Riddick. With his 16-yard return, the Browns had the ball at the New England 33, but they were unable to advance from there and punted. The teams exchanged punts into the second quarter until the Patriots put together a 60-yard drive in nine plays. Bledsoe (pictured below) completed a pass to WR Vincent Brisby for 18 yards on a second-and-ten play and, facing third-and-ten at the Cleveland 31, he connected with TE Ben Coates, also for 18 yards. A completion to RB Leroy Thompson resulted in a 13-yard touchdown and, with Matt Bahr adding the extra point, New England was in front by 7-3. The Browns responded with a scoring drive of their own that went 51 yards in seven plays, helped by a short kickoff that TE Brian Kinchen returned 24 yards. Testaverde carried twice for 14 yards and threw to Jackson for 18 yards and Jackson for 11 to set up a five-yard completion for a TD to WR Mark Carrier. Matt Stover’s conversion put Cleveland ahead by three points. New England came back with a long 16-play, 71-yard series that was helped along when, dropping into punt formation on fourth-and-ten at the Cleveland 43, punter Pat O’Neill instead threw to safety Corwin Brown for a pickup of 21 yards. Bledsoe completed three passes in all and RB Corey Croom twice converted third downs with short runs. The possession finally stalled at the four yard line and Bahr kicked a 23-yard field goal with 34 seconds remaining in the first half. In the remaining time, Testaverde completed a pass to Jackson for 36 yards and the Browns reached the New England 32 before Stover attempted a 50-yard field goal that was blocked by DE Mike Pitts. The halftime score remained tied at 10-10. Opening the third quarter, the Browns advanced to the New England 24 before RB Eric Metcalf fumbled and Pitts recovered for the Patriots. A short possession resulted in a punt and Cleveland, starting from its own 21, drove 79 yards in 10 plays. Testaverde completed four passes, the longest to RB Leroy Hoard for 25 yards, and Hoard ran for a 10-yard touchdown to cap the drive. Stover added the extra point and the Browns were ahead by 17-10. As the game headed into the fourth quarter, the teams traded punts until Pepper Johnson picked off a Bledsoe pass to give Cleveland the ball at the New England 31. The Browns came up empty, however, as three plays gained nothing and Stover’s 49-yard field goal attempt was wide to the right. The home team got the ball back two plays later when Bledsoe’s pass bounced off of FB Kevin Turner and was picked off by Eric Turner, who returned it 28 yards to the New England 36. 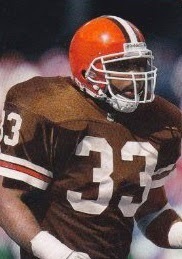 Hoard and RB Earnest Byner chipped away on the ground and Testaverde completed a pass to TE Frank Hartley for 12 yards. This time the possession yielded results as Stover booted a 21-yard field goal to extend the lead to 20-10 with 3:36 remaining in regulation. Bledsoe came out passing on the next series and connected on his first three throws to pick up 35 yards to the Cleveland 43. He completed two more and ran for three yards to convert a third down, and a throw to Brisby on a fourth-and-five play gained 12 yards. The drive stalled at the 15 and Bahr kicked a 33-yard field goal to make it a seven-point contest. There was hope for the Patriots when the second try for an onside kick was successful (the first went out of bounds), but after completing two short passes to reach the New England 48, Bledsoe missed on his last four. The Browns held on to win by a final score of 20-13. Cleveland led in total yards (379 to 303) and first downs (22 to 20), controlling the ball for 21 of the last 30 minutes. 125 of the yards for the Browns came on the ground, to just 57 for New England, and the Patriots were hurt by three turnovers, to one suffered by Cleveland. In his first postseason game, Vinny Testaverde completed 20 of 30 passes for 268 yards and a touchdown, and gave up no interceptions. Michael Jackson had 7 catches for 122 yards and Derrick Alexander contributed 5 receptions for 69 yards. Leroy Hoard (pictured at right) rushed for 66 yards on 17 carries that included a TD and also had a 25-yard pass reception. 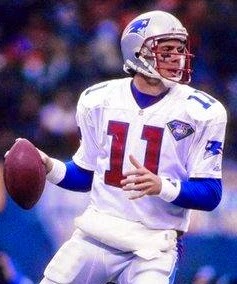 For the Patriots, Drew Bledsoe, who was sacked only once but took many hits, was successful on just 21 of 50 throws for 235 yards and a TD while tossing three interceptions. Most significantly, he was 10-of-26 for 96 yards and gave up all of the interceptions in the second half. Vincent Brisby and Ben Coates each caught six passes, for 83 and 79 yards, respectively. Corey Croom gained 35 yards on 9 rushing attempts while Leroy Thompson, who rushed for 16 yards on four carries, had 33 yards on four pass receptions that included a score. “The turnovers obviously killed us,” summed up Drew Bledsoe. The Browns came back down to earth the next week as they were thrashed by the division-rival Pittsburgh Steelers in the Divisional playoff round. With expectations high for 1995, Cleveland dropped to 5-11 in a season in which owner Art Modell announced that the franchise would move to Baltimore. Bill Belichick was dismissed but would become head coach of the Patriots in 2000, with far greater success. The franchise that became the Baltimore Ravens won the Super Bowl that same season, but Cleveland had broken all ties with that team and, in 1999, became host to a new Cleveland Browns club that inherited the history as well as the name. New England, meanwhile, dropped to 6-10 in 1995 but won the AFC Championship in ’96 in what was the last season with Bill Parcells at the helm.